The U.S. Navy christened the future USS Detroit (LCS 7), the fourth Littoral Combat Ship of the Freedom variant, in a ceremony at Marinette Marine Shipyard in Marinette, Wisconsin, Oct. 18. The Secretary of the Navy, the Honorable Ray Mabus, delivered the principal address at the ceremony, and Barbara Levin served as the ship's sponsor. As ship sponsor, Levin is considered a permanent member of the ship's crew and is expected to advocate for the well-being of both ship and crew. Levin, wife of U.S. Senator Carl Levin from Michigan, has been a longtime supporter of military families. 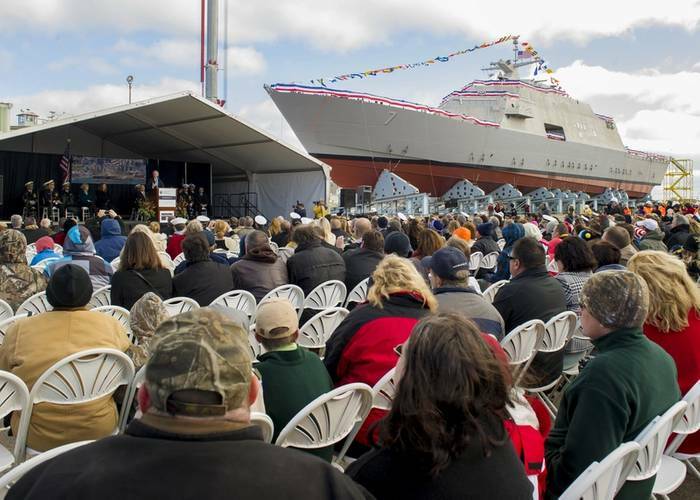 "It takes more than just cable and pipe, more than insulation and power panels, more than steel and aluminum – and more than a bottle of bubbly – to make a Navy warship," said Rear Adm. Brian Antonio, program executive officer for littoral combat ships. "The skill, fortitude, and spirit of this government/industry team are what made this day possible." Detroit transferred out of the assembly building at Marinette via several hydraulic transfer lifts and was raised into launch position in late June. 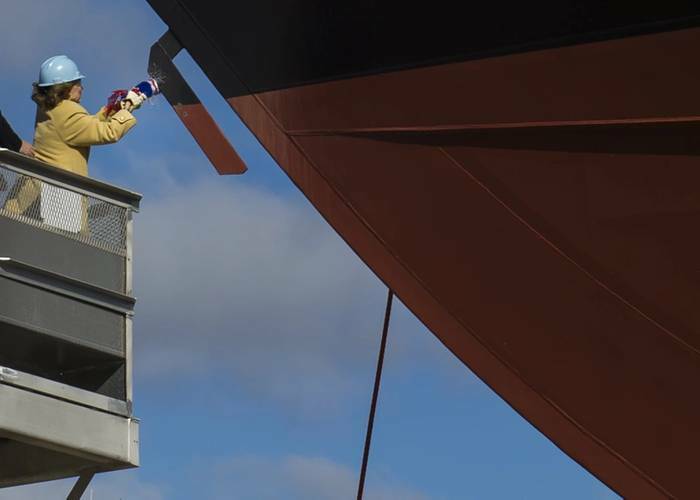 A ceremonial mast stepping, a tradition in which the ship's sponsor and crew place coins and other memorabilia beneath the mast to be permanently sealed in the installation of the mast, took place Oct. 17. A dramatic side launch of the ship into the Menominee River followed the christening ceremony. Detroit is an innovative surface combatant designed to operate in littoral seas and shallow water to counter mines, submarines, and fast surface craft threats in coastal regions. The ship's name recognizes the city of Detroit, Michigan, and honors the state's deep ties to the U.S. Navy and the shipbuilding industry. After its launch, Detroit will continue to undergo outfitting and testing at Marinette until her expected delivery to the Navy in late 2015 following acceptance trials. The ship is capable of speeds in excess of 40 knots and can operate in water less than 20 feet deep. Detroit will address a critical capabilities gap in the littorals and conduct the Navy's mission to enhance maritime security by deterring hostility, maintaining a forward presence, projecting power, and maintaining sea control. The LCS class consists of the Freedom variant and Independence variant, designed and built by two industry teams. The Freedom variant team, led by Lockheed Martin, has delivered LCS 1 and LCS 3. The Independence variant team, led by General Dynamics, Bath Iron Works has delivered LCS 2 and LCS 4. Austal USA is the prime contractor for the subsequent even-numbered hulls. There are 12 additional ships currently under construction out of 20 ships contracted under an innovative Block Buy acquisition strategy. LCS is a modular, reconfigurable ship, with three types of mission packages: Surface Warfare (SUW), Mine Countermeasures (MCM), and Anti-Submarine Warfare (ASW). The Program Executive Office for Littoral Combat Ships (PEO LCS) is responsible for delivering and sustaining credible littoral mission capabilities to the fleet. Delivering high-quality warfighting assets while balancing affordability and capability is key to supporting the nation's maritime strategy.